Q. What is the most essential factor in your healing and success of the therapy? Research shows consistently that no matter what counseling method is used, the connection between you and your counselor is the essential factor in you feeling better about yourself. We work hard to create a safe and supportive relationship in our counseling. Our clients are really heard, acknowledged and supported, because we know that this is THE key to personal and relationship transformation. We also teach you skills for coping with difficult feelings and situations. Learning how to be resilient and knowing that you really know how to support yourself through life’s challenges will give you a sense of empowerment and self-esteem. Our clients tell us they appreciate that we are active in the sessions, supportive, and very practical. Q. What kinds of clients do you see? Our practice is inclusive and welcoming to individuals of diverse backgrounds, cultures, religious traditions, and lifestyles. We work only with adults. We are happy to make referrals for children, teens and families. If you are seeking to make a positive change in your life, we are eager to work with you. Q. What will happen when I call? We welcome your call. We want to answer your questions and help you feel comfortable with us and the process of counseling. If you call us when we are in session, please leave a message on our confidential voice mail. We will call you back as quickly as we can. We will answer your questions and provide a brief, free consultation about your situation. For more information or to schedule an appointment, call 480-990-9128 (Sandy) or 602-538-9094 (Douglas) or Kristine (480-442-7565). Q. How often should I come in? Most clients come in for weekly appointments. As you are feeling better, we can cut back on the frequency of the sessions so you have more time to integrate what you are learning into your daily life. Sessions are 45-50 minutes long for individuals. An 80 minute session usually works best for a couple. We accept checks, cash, debit, and all major credit cards. We are happy to provide you with statements of charges and payments. You may choose to submit these statements to your insurance company for reimbursement directly to you, if you have out-of-network benefits. These statements are also useful to support withdrawals from a Health Savings Account (HSA) or medical deductions on an itemized income tax return, if your tax adviser so directs. Good therapy – with lasting results – takes time, attention and work. Every client is different. Our work is customized to you and your needs. We are committed to helping you achieve deep and lasting change. During the first few meetings, we will review your history, goals, and discuss the kind of results you can expect in counseling and what you will need to do to help make these results a reality. At regular intervals, we will check with you about how you see your progress and make any adjustments necessary to keep you moving towards the goals you desire. Q. Are you going to tell me or us what to do? We are here to help you sort through your thoughts and feelings. We will offer suggestions but we will not tell you what to do. We have too much respect for you and your own wisdom. Q. Do you only work with couples? What if I don’t have a partner? We are dedicated to working with individuals as well as couples. We have a great deal of experience working with a wide variety of issues and life stressors. Q. My partner is not ready to attend counseling, but I still need help. Can I come in alone? Yes. Doing your own counseling can help you approach your partner in a different way, to create a safer, more connected relationship. This might increase your partner’s willingness to engage in couples counseling. More importantly, the changes you make might be enough to change the relationship in the direction you want. Q. What are the advantages to me of working with a wife/husband therapist team? We can work with you individually or as a co-therapy team, depending on your needs and desires. We practice and refine every relationship skill ourselves before we share it with you. This gives us a deeper level of knowledge and experience than mere book learning could provide. In cases where a relationship requires both couples counseling and some individual work, you may choose to have one of us work with the couple and the other with one partner. If we determine that both partners will significantly benefit from individual counseling, we will be happy to make these referrals. This team approach, should you select it, allows for excellent coordination of your counseling. 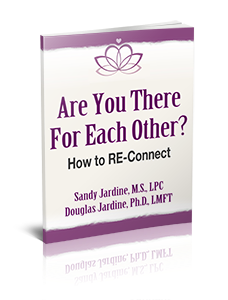 Some couples desire and will benefit from co-therapy in which both Sandy and Douglas are present in the sessions. Even though this increases the per-session cost, some couples find the experience of working with a husband/wife therapy team of special benefit and an accelerator of change. Q. When is individual counseling a wise choice? IMPORTANT: Besides Sandy, Douglas, Kristine and Sophie (the dog), none of the faces shown on this website have any connection to our practice. Our clients will never be shown or named in any promotional materials. Maintaining client confidentiality is always the highest priority to us.